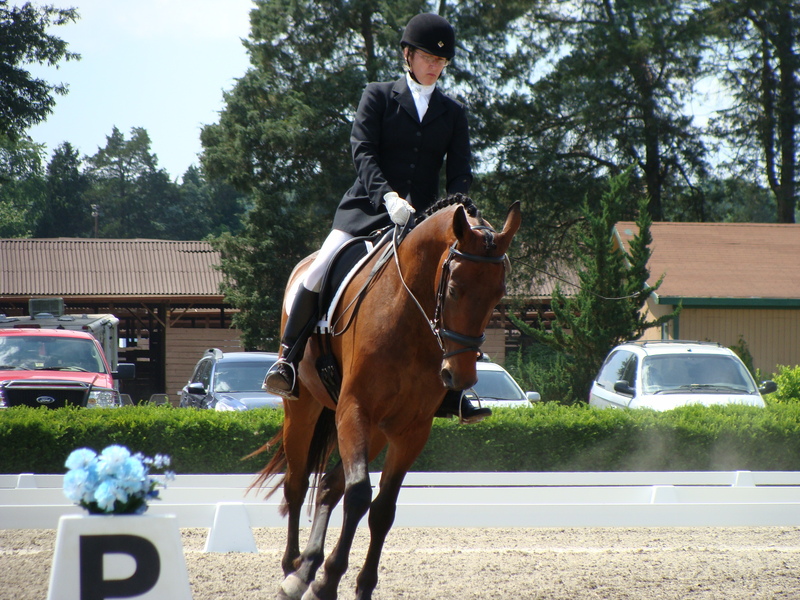 This is a photo from last weekend…what about photos from this weekend’s schooling show you ask? There are none. We can thank Mother Nature for the lack of schooling show scores and photos. She decided to unleash the heavy rain showers over the show venue for most of Saturday night. That left the venue’s warm-up and show arenas looking more like very large puddles. And, since parking is in the two of the fields of the farm, there would have most likely been some damage to the grass and one or two trailers getting stuck as well. At least it happened on a schooling show weekend and not last weekend when the scores counted for qualifying. It is always a bummer when you have worked hard and then don’t get to head out as planned. I don’t think Ike minded having the day off, but I was looking forward to see what our scores would be after two lessons with Ms. C and a chiropractic adjustment this past week. It will now be August before we head out again. And while I’m complaining about Mother Nature, let me just say how much I love the heat and humidity that she brought to us after the rain on Saturday night. Sunday afternoon when the sun emerged from the clouds was not a fit day for human or beast to be outdoors. If Ike and Cigar could have come home and reclined on the sofa (if the dogs would have made room for them) in the air-conditioned comfort of our living room, I’d be cleaning up one heck of a mess today. Monday has been another hot and steamy day topped off with some afternoon thunderstorms. After the monthly farrier visit for both boys, I did attempt to ride. Yuck. I was sweating even before I mounted. Ike started sweating a few minutes later. Not long after that, the first horse fly of the season decided to come say hello along with the usual contingent of common flies and green heads. We lasted 20 minutes before fleeing to the barn to the shade and safety from the horse flies. Just like last year, they appear to be unable to breach the barn door. Don’t think anyone is complaining about that. Be safe from the summer storms. Don’t you just hate humidity for work, riding, or athletics?! It is the absolute worst. Loved that image of Ike and Cigar lounging about on the couch. I have no doubt they’d squeeze on the sofa if they could…thanks about the photo. My husband took it the first ride of last weekend.